Sometimes when we tell people that we travel across the country twice a year with our cats they give us the strangest looks. Heck, when we are driving and people in other cars see our cats they just kind of stare in disbelief. All cats kind of get a bad wrap for being bad car passengers, but when it comes to our feline friends nothing is further from the truth. When we got both Wigs and Littlemin I knew there would be lots of traveling, so I made sure both of them would be used to being comfortable in a car. 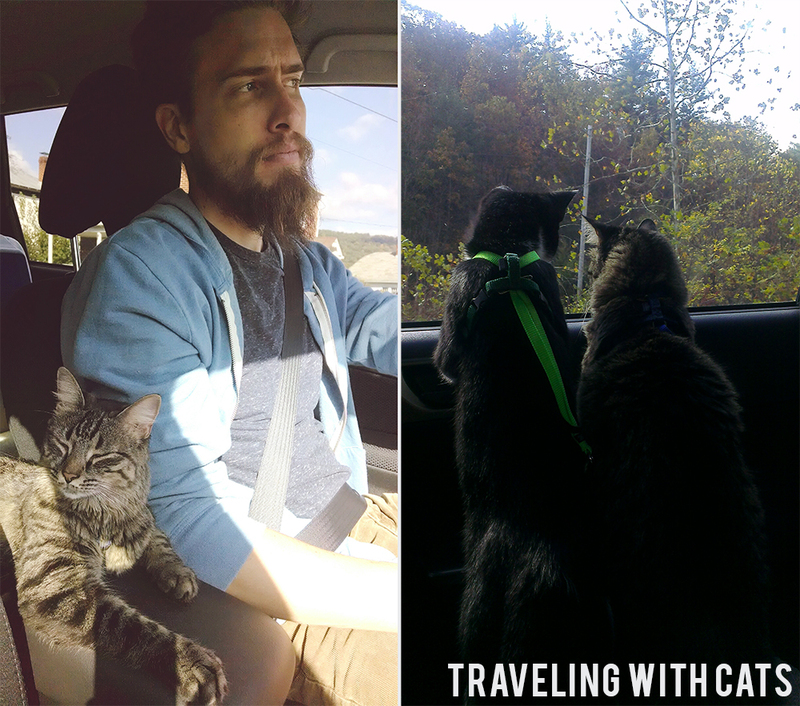 I couldn't imagine spending multiple days in the car with yowling cats, haha. I heard, years ago, on an Animal Planet show that you should drive your kitten around in the car to get them used to it. So we would drive both Wigs and Littlemin around the mountain when they were little a couple times a week. Wigs became an old pro at the traveling thing in no time. Her favorite way to sit is what we like to refer as the car seat, haha! While Littlemin has been a little more cautious about the whole thing, he likes to sleep under one of the seats of the car to begin with, then after a couple of hours will make a bed of the back seat. Once your cat is ok with being in the car there are a couple things you can do to make them a little more comfortable. Have their litter box easily accessible to them. Unlike dogs, cat typically won't just go outside when you stop for gas or snacks, so it's a good idea to have their bathroom ready for them to use whenever they chose to. Have some food and water out. We always try to keep just enough water in their bowl so we don't have a sloppy back seat if we hit a bump, haha. Bring some kind of scratching post. We have a rectangular cardboard one. After a long nap in the car our two friends like to stretch and scratch something and we would much rather them scratch the scratching post than the back of our seats. We also have them wear their harnesses with tags when in the car. We do this so we can easily get their leashes on when we are getting out. Are there any special things you guys do when traveling with your pets or have any photos of your travels with them? If so I would love to know what they are and see some fun photos, so leave links in the comments. I would love to travel with my cats... But one of them literally howls the whole way to the vet (5 minutes) and when we moved an hour away, she howled and ripped her claws to shreds on the way. We tried to drive them from when they were kittens, but she never got used to it. I'm so glad your cats are more co-operative, it sounds like a blast taking them for a roadtrip! These two, I just love them!! They're some of the coolest cats ever! I'm so envious of the ease you have. My husband and I will be moving soon (about 2 hours away) and we have FIVE cats. None of which are pleasant when in the car...ugh. This is so cute! No need to worry about them when you have to go on a trip! My dog is a terrible traveler! Your cats are so much better. When in the back seat my dog insists on standing up so he can see what's going on, but this means if we stop quickly he lurches forward into the gap between the back seat and the front seat. If you make him lay down he will only stay there for a couple minutes before standing up again. When we put him in his kennel he is more sturdy and safe, but he whines! 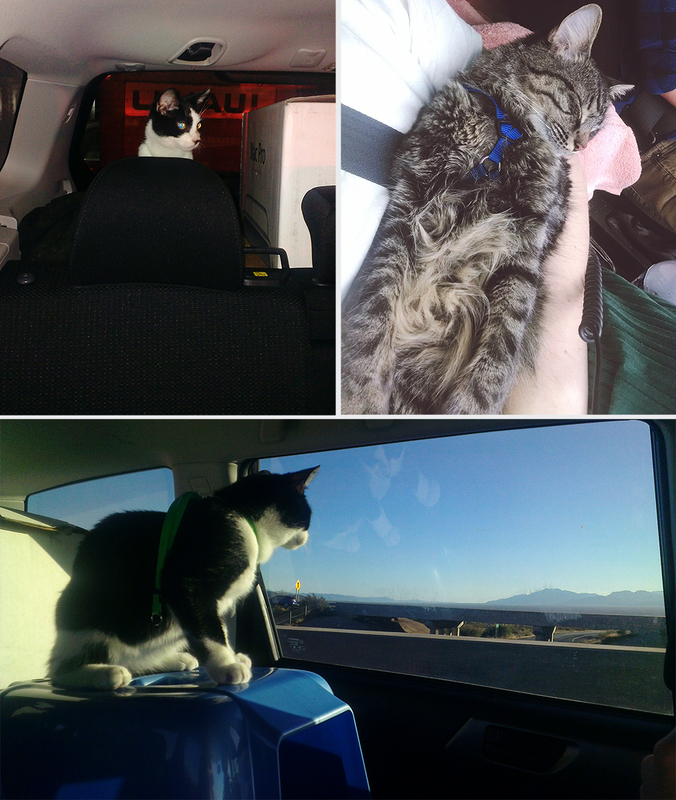 I love that your cats travel with you! Such a great post! I'm much more accustomed to traveling with a dog but can totally relate. We started taking our dog for drives when she was a puppy and we recently moved across the country which was a 40 hour drive. Nobody believes that she basically slept the whole way, but she did!! While she's a good road tripper, we're still working on her city drives...she never calms down because she's always looking for cats ha! Your cats are awesome! I love this post! It must be so exciting to bring your cats outside of the house and have them explore places that you visit!